Golden Retriever Dog and Puppy Information | Golden Retriever Savvy " "
There are many great ways you can bond with your Golden Retriever dog to make your companionship grow. The only trick is you need to be willing to take the time to devote to your dog. However, this shouldn’t be a problem for you because you got a dog for their company right? 1. Go for walks – Take your Golden Retriever dog for a nice long walk around your neighborhood. Let him enjoy the scents and smells that are constantly changing. This will help to make every outing a new adventure for your dog. If you want to make the walk even more interesting take a different route everyday. Even if there is only one route you can take, each day, alternate the direction you take. You can also take your Golden for a drive in the country and take him for a walk out there. 2. Play fetch – Dogs love to play games of fetch, especially Golden Retrievers who naturally love to retrieve things. You can play fetch with a ball or any other toy your Golden really seems to like. In fact, a Frisbee is often one of the best toys you can play fetch with. Frisbees provide your dog with a bit of a challenge. Since they soar through the air, they give your dog the opportunity to jump for it. 3. Go swimming – If you’ve discovered your Golden Retriever dog likes the water, take the time and go swimming. Not only will this provide your dog with great exercise, but it’s also a lot of fun. 4. Enjoy a picnic – Pack a good lunch (one for you and your dog) and head out together to the nearest dog-friendly park. Play fetch and go for a nice leisurely stroll before settling down to a nice lunch. Take a blanket so both you and your dog can enjoy lunch together and have a relaxing lie down after. 5. Watch a movie – On a rainy day, choose to spend a night indoors with your dog. Rent a movie that has plenty of dogs in it (as your Golden Retriever dog will love to see other dogs even if their on TV), pop some popcorn, grab a few bones, sit down and enjoy. Even if you dog doesn’t seem to care about the movie, he’ll love being able to chill out with you. Just remember to turn off the surround sound and keep the volume at a reasonable level that won’t bother his ears. 6. Go to the store – Most pet stores welcome animals. This is a perfect opportunity for you to take your dog out so he can pick his next toy. He may also get an opportunity to meet other fellow canine friends and will also be happy because he’s with you. 7. 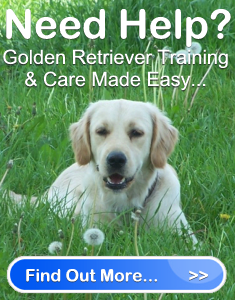 Learn new things – Your Golden Retriever dog enjoys learning, and is always ready to please you. There are plenty of tricks you can teach him. Just make sure you keep it fun, and limit the training time to short 10 minute sessions. Learning shouldn’t be a frustrating process for you or your pooch. It’s really easy to bond with your Golden Retriever dog. He’s always ready and waiting to spend time with you. You have every opportunity to build a beautiful companionship you can always cherish.